Many people think creativity starts with an idea, but the reality is most creative ideas do not just pop into your head. If you want to come up with creative ideas, you need to establish the circumstances for it to happen. You cannot just hope for inspiration to strike, you have to plan and prepare for creativity. Graham Wallas theorizes the creative process in his book, The Art of Thought. In this book, Wallas asserts the creative process comes in four stages of creative thinking. In the first stage of the creative thinking process, you define the problem, need, or desire, and then collect any information regarding the topic or problem. Your goal is to acquire as much knowledge as you can about the topic or problem. After you gather the information, you read, sort, evaluate, organize, and outline it. You do anything that can help you move towards finding a solution. You want to immerse yourself in the topic or problem. In this stage, you are trying to absorb as much information as possible to allow this information to go into your subconscious. 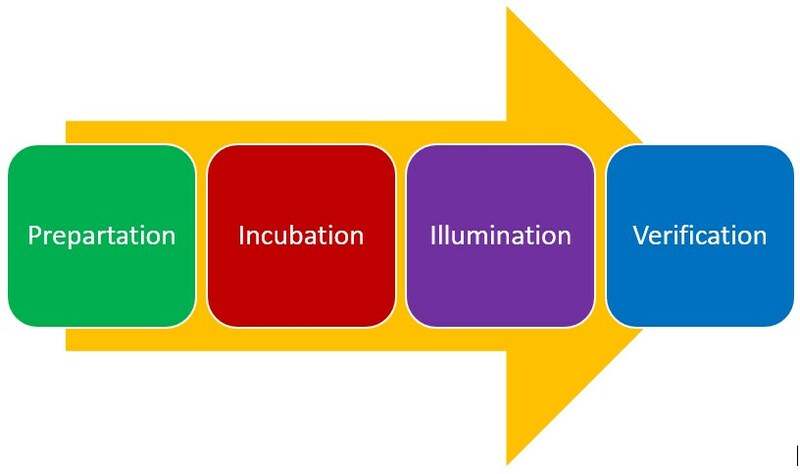 Incubation involves mentally processing the information you collected in stage one. The information will begin to churn in the back of your mind. Your conscious and subconscious minds both work on the idea. Your begin making new connections, separating out unnecessary information, and cultivating new thoughts. As you move through the incubation stage, you want to slowly step back from the topic or problem and let your mind contemplate and work through potential solutions or ideas. Letting your mind wander leads to greater creativity. The unconscious thought process involved in creative thinking is at work during this stage. Therefore, you what to stop consciously thinking of the topic or problem and turn your attention to something else. You may go for a walk, go for a jog, or do some gardening. Basically, anything that can give your conscious mind a rest. You want to give your unconscious mind time to digest all the material you gathered in the preparation stage. All the information that you gathered slowly starts to take a subconscious effect. You stop consciously thinking about the problem you are trying to solve. After a period of incubation, the creative ideas often occur unexpectedly. The incubation stage can last minutes, weeks, or even years. This is the stage where the idea, which has been incubating, suddenly takes shape. This is the “Aha Moment,” or the “light bulb” or “Eureka” moment. This usually comes when you are not actively thinking of a solution or creative idea. You are often doing something else like exercising, taking a shower, driving, or just resting. You will typically have an emotional reaction of joy, knowing you have found the idea or solution for which you have been searching. This is the feeling you get when you have been struggling with your thoughts and cannot quite put your finger on what is missing. Suddenly, the ambiguous becomes clear. The idea appears suddenly and comes with a feeling of certainty. This is when all the pieces to the puzzle seem to fit together. Your overwhelming impulse is to get the ideas down on paper or other recording instrument. Unlike the other stages, illumination is often very brief, involving a tremendous rush of insight within a short period of time. After you come up with a creative idea, you want to determine if it will work or not. Therefore, in the final stage of the creative thinking process, you want to evaluate, test, and hopefully verify the idea that came to you in the illumination stage. You need to use your analytical and critical thinking skills to vet your idea. If the idea or solution is not going to work, you may have to go back through the creative process from the beginning. However, if it is acceptable or if you just need some minor modifications, the creative process is complete.